Dark Souls battle royale existed at some point in the From Software offices. Can you imagine? 100 Solaires leaping off the back of the ancient dragon, preparing for brutal, deliberate melee combat on the field far below, each collecting souls from one another but none able to cash out until there’s only one left – of course, it probably wouldn’t have worked out exactly like that. 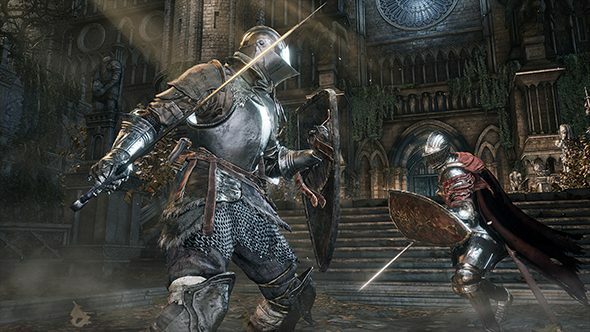 There was multiplayer mode for Dark Souls III called, literally, battle royale. That’s according to indie dev and YouTube Lance McDonald, who has recently shifted his datamining and pre-release exploration efforts from Bloodborne to Dark Souls III. And, indeed, this cut mode was present in an alpha version of the game. Imagine a world where, technically, Dark Souls could’ve been one of the best battle royale games. You can see the relevant file name in McDonald’s tweet below. My Japanese knowledge goes only slightly beyond watching subtitled anime, but I can say the characters in that file name are identical to those in the Japanese title of the movie Battle Royale – which, in turn, is a very direct transliteration into Japanese phonetics as Batoru Rowaiaru. But even though the transliterated English words “battle royale” are there, this almost certainly wouldn’t have been what that moniker now refers to – after all, Dark Souls III predates PUBG by some time. More likely, this would’ve been a catchy title for a more traditional multiplayer mode, which is still a curiosity given Dark Souls’ unique PvP invasion systems. If you’ve been a Souls fan living under a rock since before E3, you should also set your radar toward the Sekiro: Shadows Die Twice release date. It’s not exactly a Souls game, but it is the next major project from Hidetaka Miyazaki and the folks at From Software.